At the end of September, Alcons Audio USA will exhibit at the industry-leading AES Convention in Los Angeles for the first time. In a joint presence with immersive audio specialists Astro Spatial Audio, Alcons will demonstrate how its systems aim to take listeners to the next level of three-dimensional sound technology. Alcons’ AES debut follows a recent series of 3D sound demonstrations with Astro Spatial Audio in LA and Las Vegas, as well as an imminent second year showcasing the Alcons Pro-Ribbon Immersive Experience at the CEDIA home technology show in Dallas. 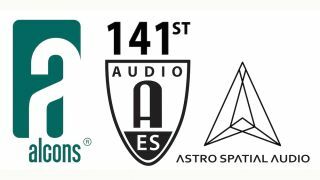 Demonstrating in AES demo room 511C, visitors to AES will discover how Alcons loudspeakers are the natural counterpart to Astro Spatial Audio’s SARA 3D audio rendering technology. Using state-of-the-art advancements, the SARA system delivers an immersive experience, making it well suited for facilities including theatres, opera houses, concert venues, theme parks, and houses of worship. Alcons loudspeaker systems feature proprietary, multiple-patented, pro-ribbon transducer technology, which delivers the ultimate clarity, detail and up to 90 percent less distortion, without sacrificing any of the power demanded by entertainment audiences. These qualities aim to ensure that audiences in the immersive 3D envelope hear everything, from the quietest to the loudest sounds, with stunning clarity. The AES demonstrations will feature a 10-position speaker layout, plus front and rear cardioid subs, utilizing a range of Alcons pro-ribbon systems, including LR7 micro line-array (RBN401 4-inch pro-ribbon HF and 6.5-inch LF), QR24 line-source module (two RBN1203 12-inch pro-ribbon HF and six 6.5-inch LF) and the BC332 18-inch plus 15-inch self-contained cardioid subwoofer. All systems will be AES3-digitally driven by Sentinel amplified loudspeaker controllers. The 2016 AES Convention takes place at the Los Angeles Convention Center from September 29 to October 2.